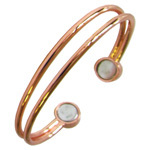 Glimmering, pure copper bangles feature embedded magnets. 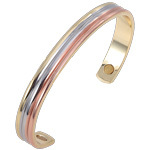 Wearing copper bracelets for medicinal benefits has a long history, all the way back to ancient Egypt. Proposed benefits focus on reducing joint inflammation and easing pain. 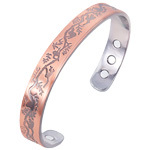 Researchers attribute the benefits of copper bracelets to the absorption of trace minerals into the bloodstream. 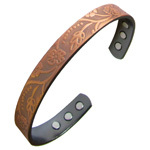 Microminerals of iron and zinc, present in the copper, combine with sweat on the skin. From there, the body absorbs these minerals, adjusting any deficiency. A low constant dosage of these microminerals in the blood provides immediate and long-term benefits for tissues an joints. 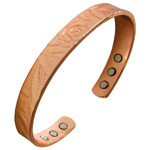 Promoters say magnetic bracelets work because certain cells and tissues in the body emit electromagnetic impulses. Theoretically, when disease or injury hampers their flow, magnetic energy can rectify the imbalance and reestablish health.